Donald Trump’s election to the presidency has seen the stock market reach record highs as the nation’s top executive has pledged to cut regulations and create more jobs. It’s also featured some high-profile clashes with foreign countries, including some top allies. It appears voters are expecting both of those trends to continue over the next four years, according to a new Morning Consult/POLITICO poll. Almost half of voters surveyed over the past weekend said they expect the economy (45 percent) and job growth (47 percent) to get better during Trump’s first term. At the same time, roughly half (47 percent) of respondents also said they expect relations with other countries to worsen. More than half of Democrats (53 percent) expect the economy to get worse, while 3 in 4 Republicans said it’d get better. Almost half (45 percent) of Democrats said the same for job growth, while 74 percent of Republicans thought it would improve. Almost 7 in 10 (69 percent) Democrats said relations with other countries would worsen, compared with 21 percent of Republicans. 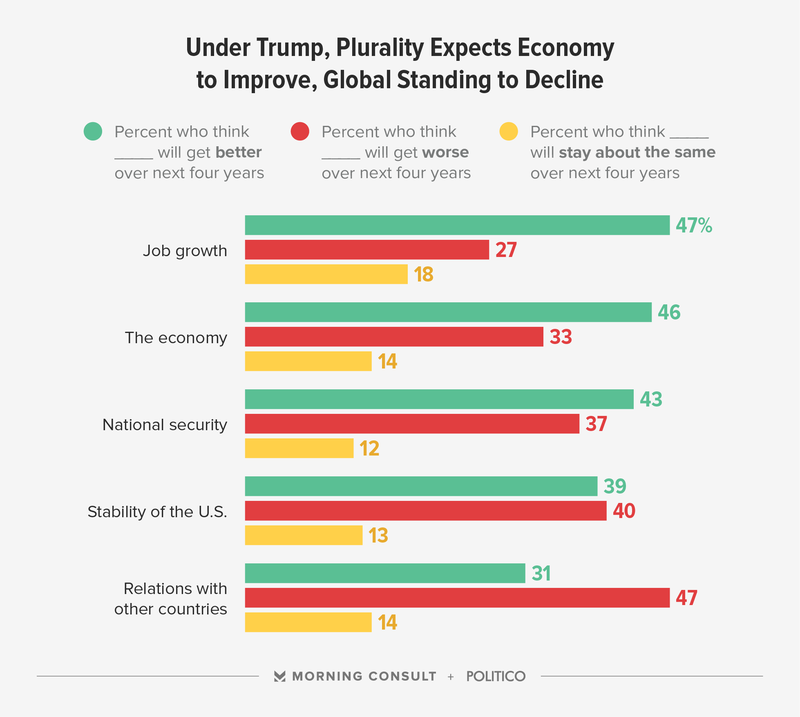 Independents, by comparison, were more bullish on the economic forecast than they were on the U.S.’s standing in the world: Roughly 40 percent said job growth and the economy would improve, whereas just 23 percent expected the country to improve its relations worldwide. Voters were also split on the subject of safety. While 43 percent said national security would get better, 37 percent voiced the opposite sentiment. Trump’s first month in the White House was packed with action, from a litany of executive orders to high-profile court wranglings over his controversial travel ban, with plenty of other news cycle-dominating events in between. It appears voters might be ready for a breather: 4 in 10 (41 percent) said the stability of the U.S. has declined since Inauguration Day, compared with 28 percent who said it has improved. Voters are split on whether things will settle down in the future, with 40 percent saying stability will get worse and 39 percent saying the opposite. Overall, Americans’ are still in a much better mood than they were just after the election. Forty-one percent of voters said the country is headed in the right direction, compared with just 29 percent who felt that way immediately after the presidential election. That thinking appears to be reflected in Trump’s approval rating, which bettered by one over the previous week and remains in favorable territory: 49 percent approve vs. 44 percent disapprove. The national, online survey polled 2,013 registered voters Feb. 16-19. It has a margin of error of plus or minus 2 percentage points. See more here.